Priority Shipping, 2017, is a monochrome acrylic painting, with stainless steel shapes and resin on a shipping pallet. This is the last work of the Sculpture Reconstructed series. 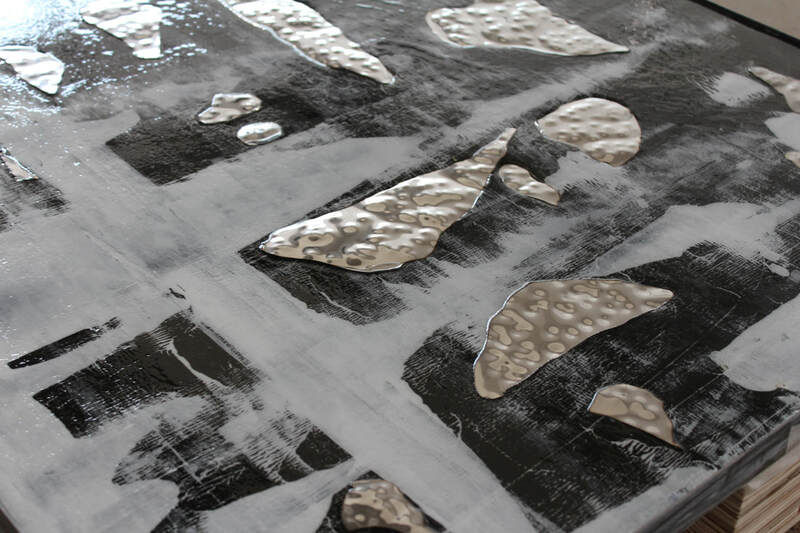 ​The abstract painting was created using an ink roller, and the stainless steel shapes are sculpturally moulded with intricate details formed through hammering. The placement of the steel shapes was intuitive and responds to the shapes formed by the shapes left by the paint. It is a very organic piece, led by the process of creating art and exploring materials. The title Priority Shipping came about as the piece was formed from a shipping pallet, and critiques the shipping and selling of art as a commodity. Shipping pallet, Acrylic paint, Stainless steel, Mild Steel, Resin. 161 x 76 x 13cm.